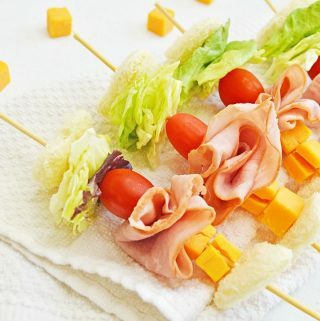 These ham and cheese sandwich kabobs are heart-shaped sandwiches. Make these sandwich skewers for mini kebab party appetizers or a mini kebob sandwich. Use your cookie cutter to cut out two fun shapes for each kabob (8 total). Add your sandwich ingredients to your kabob in this order- 1 piece of bread, lettuce, cherry tomato, ham, cheese cubes, followed by a final piece of bread.